1st Page: Select period of stay, guest, room, promotion / package, additional services and then check final price. note: You’ve two options; advance payment or just credit card to guanrantee the reservation. 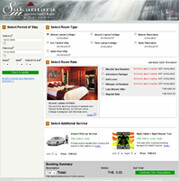 The first case, Guest will be redirected to hotel’s online payment gateway. 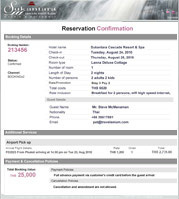 3rd Page: Guest can print this page as a hotel confirmation voucher. At the same time, our system also automatically sends this confirmation notification to hotel’s and customer’s email. Pay small fix & enjoy more bookings. Good option for new hotels, then change plan later. Our pros team is ready to push more sales & brand for you. Smart long-term investment for your hotel. More than 30% of travellers are willing to book directly with a hotel’s site if direct offers are more valued and additional services like airport pick-up or in-house spa services. If you offer the room only or room with breakfast, customers tend to book with online travel agencies due to the lower rate or reward program. With our system, you can sell in the way you like, make it differently.add interesting stuff..create packages...know what they need. How you gonna collect deposit from customers who book via phone or email? Asking customers to fax or email their credit card details costs you time and risk to lose customers who got conservative use of credit card. Few booking system allows you measure visitor behavior patterns interacting with each booking step. Our analytics intelligence monitor and record significant data; for example, bounce rate, period of stay, most-click promotion, exit page, nationality and else. With these significant data patterns, you can better understand visitor intent, find out what your customers are really looking for and improve your offers to increase conversion rate.